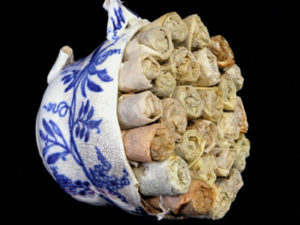 Since 2011, I have been working on an ongoing art project, A Better Cup Of Tea, with the common thread being used tea bags and their components. I transform volumes of these everyday items into stunning installations. 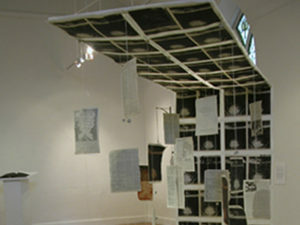 The work has evolved into various series of pieces based on different elements of the tea bags. 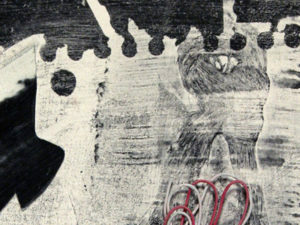 During the year 2009, I began working on a compilation called Project 52: each week I created a small collage, 6.5″ x 4.5″ into which I recycled prints from my studio that required more work or a new context, as well as the female shape and diverse found objects. 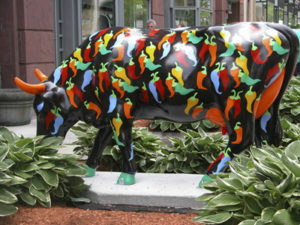 An art exhibit of life-sized cows from a myriad of artists, with auctions at the end of the event benefiting charities. The Project began when I found ten discarded volumes of Britannica Yearbooks on the street, spanning the years 1938-1948, minus the 1939 volume, which was missing from the group.